IDW starts its story in 1992, when Keith Kroehler and his wife, Lisa, decided to move from Minnesota to Lisa’s hometown of Lima, Ohio. Their reasoning was twofold: to be closer to Lisa’s family and to live in a place with warmer winters. 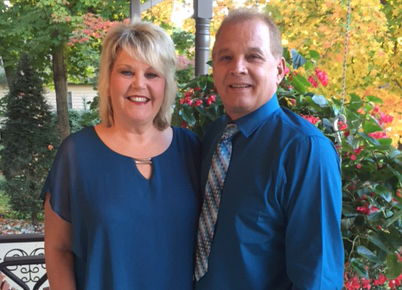 While the couple had been living in Minnesota, Keith had started a window cleaning company, and when they moved he continued it in Ohio. Keith worked alone until 1996 when Lisa left her career in television journalism and marketing to join her husband. Together, they expanded the I DO WINDOWS! LLC and grew the business. Now, after many years of hard work, the company services clients across Ohio and throughout the greater Fort Wayne area. IDW was recognized in 2006 by the Lima/Allen County Chamber of Commerce as “Woman Owned Business of the Year.” At IDW, our residential clients, many of whom we have been serving for years, constantly rave about our employees level of professionalism and workmanship. Our work is important to us. We only hire hardworking, trustworthy, and dedicated employees. IDW technicians are professional, clean cut, polite, knowledgeable and trustworthy. Before we hire anyone, we thoroughly conduct background checks and check references from previous employers. IDW is a family owned business and we strive to make sure that our staff consists of people of integrity. This company has been around for more than 25 years – reliability, a strong work ethic, and honesty have been the backbone of its success. We do what we say we will do and work hard to keep our customers calling year after year. Safety is our number one priority and all employees regularly participate in safety training seminars and meetings. Our lift operators are certified and our technicians are well trained in fall protection, operator training, emergency training, workplace inspection, hazard communication, and more. In addition to our window cleaning, IDW Window and Roof Cleaning also offers Soft Washing services, roof cleaning, pressure washing, gutter cleaning, light fixture cleaning, and high dusting services. With one call you can get every exterior cleaning service you need, and we offer additional interior services for your convenience. IDW commercial clients include corporate centers, financial institutions, hospitals, universities, hotels, government buildings, and retail establishments. 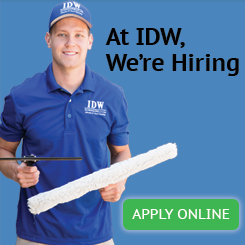 Janitorial firms also subcontract with IDW to service their commercial clients. The company’s expertise includes man lifts, deionized water-fed pole systems, and ladder work. IDW employees are professionally trained, following OSHA and ANSI guidelines for safety as well as regularly undergoing company safety training. IDW Window and Roof Cleaning is a member in good standing with the International Window Cleaning Association and is a Five Star Authorized Company with Soft Wash Systems.